Time was when a baby Naim delivered about 7W per channel, as per the original 1985 Nait. By 2010 however, small boxes from Salisbury like the (then) new UnitiQute put out 45W a side – and threw in DAB, FM, uPnP streaming and USB sources, and had a built-in DAC and analogue inputs for good measure. How times change! It was the seamless way that the UnitiQute brought so many sources together in one small package that made it so special, and the great sound that they all made considering it was a one-box system. Hidden deep inside its chunky case, the preamplifier had two analogue inputs, five 24-bit/192kHz-capable digital inputs (via a Wolfson DAC), FM and DAB tuners and the ability to play music from an iPod or MP3 player via its front panel-mounted USB socket (with digital iPod playout, Apple authenticated); the USB socket also played (up to) 24/96 music files from a USB memory stick. A network Ethernet socket and integrated Wi-Fi also came as standard. The power amplifier was claimed to make 45W RMS per channel into 4 Ohms, 30W into 8 ohms. Naim said it had a linear power supply with a 200VA toroidal transformer with three separate windings, and there were separate power supplies for digital, analogue, and power amplifier. There was also a ground selector switch for optimum performance. All this went into a beautifully neat non-resonant, non-magnetic case, fronted by a superb green OLED fine pitch dot-matrix display. Vital statistics were 87x207x314mm and weight 5.6kg. Whilst the UnitiQute surprised and delighted in many ways (24/96 from a USB stick was cool in 2010), it wouldn’t play out Apple Lossless, although it would play the Lossless files digitally from an iPod. 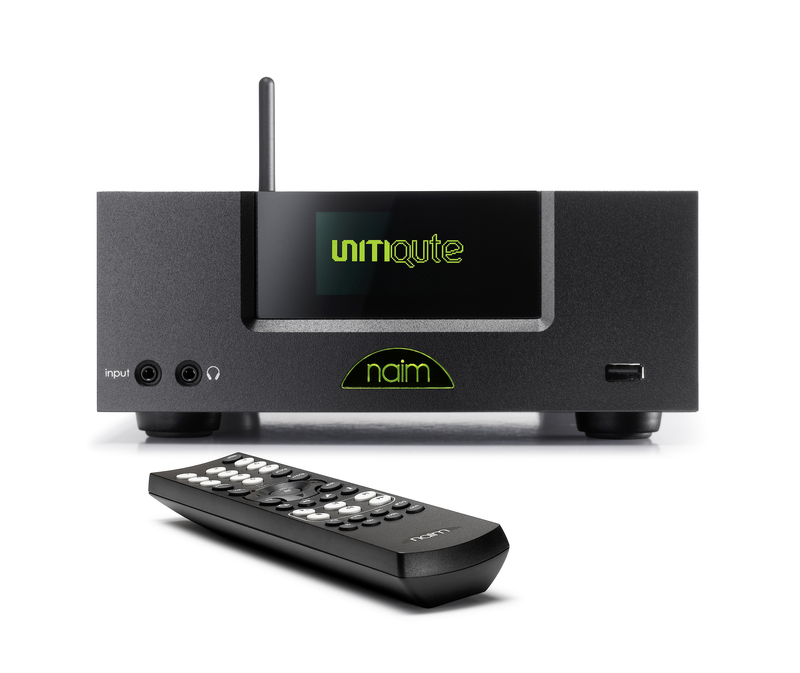 The little Naim also played WAV, Windows Media-formatted content, AAC and FLAC from any suitable UPnP device. MP3 was also available for those who wanted to wallow in the mire! The UnitiQute’s sound was a tricky thing to triangulate. In the great scheme of things, it was better than any other product of its type, with a dry, clean sound with a strong, taut and punchy bass. The wee Naim let songs flow better than many similarly priced amplifiers, making for a gripping and bouncy rendition of whatever music you fed it. Although not tonally the warmest of performers, it certainly wasn’t hard or unpleasant. Its sound was detailed and crisp with a nicely finessed treble which made for a very grown-up sound. Here was a brilliant little music box then, a dazzling do-it-all small system with great build, fine ergonomics and strong sound.